PLDT Calliday promo offers unlimited NDD calls and discounted IDD for only P100, you can now say your sweetest words to your family and love ones here and abroad. Get 7 days unlimited NDD call on your P100 with PLDT Calliday promo and enjoy lowest rates for only P1.50 per minute calls to USA, Canada and Hawaii. 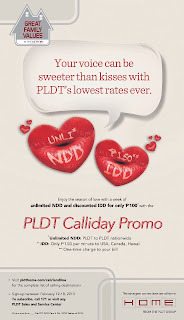 Never miss to call and greet your love ones this season of love with PLDT Calliday promo. How to avail or apply this promo? Sign-up between February 12-18, 2013. For complete list of call destinations, you may visit pldthome.com/call/landline.